Luna Bars are now gluten-free. When we opened this package at our studio, our daughter Lucy read only one phrase: chocolate cupcake. “Can I have that one please, Mama?” We were about to head out for a big day in the city and lunch had been rushed. She would need more energy for all that activity. You bet. Decades ago now, I ate Clif Bars. Remember how strange protein bars seemed when they first hit the market? It’s hard to imagine it now, but bars used to be food only for mountain climbers and hikers and endurance runners. Now, Luna bars (part of the Clif Bar line) are designed for women on the go, running between meetings or needing more nourishment during the day. For those of us who are gluten-free, having something tasty to keep in our bags for those in-between moments is even more imperative. Whenever we travel, I’m struck again by how hard it can be to eat gluten-free in airports and train stations and away from home. There are quite a few gluten-free bars out there now. We like some of them well enough. But something that is consistently delicious is pretty tough to find. From now on, when I travel, I’m taking Luna Bars with me again. Luna Bars aren’t specifically kid treats. They’re designed for women, after all. However, if you have a gluten-free kid, finding something delicious for the road can be tough. At home, Lucy chooses goat cheese spread on apple slices or peanut butter on some of our grain-free sandwich bread. This kid is always dancing or running or climbing. She needs snacks that give her good energy. She’s choosy about her foods, especially when it comes to texture. She rejects anything too sticky or strange in the chew. (She’s 6, after all.) However, this gluten-free Luna bar was a big hit. She ate it all and asked for another the next day. (Luckily, she also liked the Blueberry Bliss and the Lemon Zest bars.) Since these bars have good protein, fiber, no artificial ingredients or preservatives, and 70% of the ingredients are organic, I like having them for Lu as an emergency stash for traveling and afternoons of unexpected energy crashes in my active kid. I’m thrilled Luna Bars are now gluten-free. This company has taken care to make something good for those who have to be gluten-free. And they’ve made it delicious. Around here, that makes us happy. 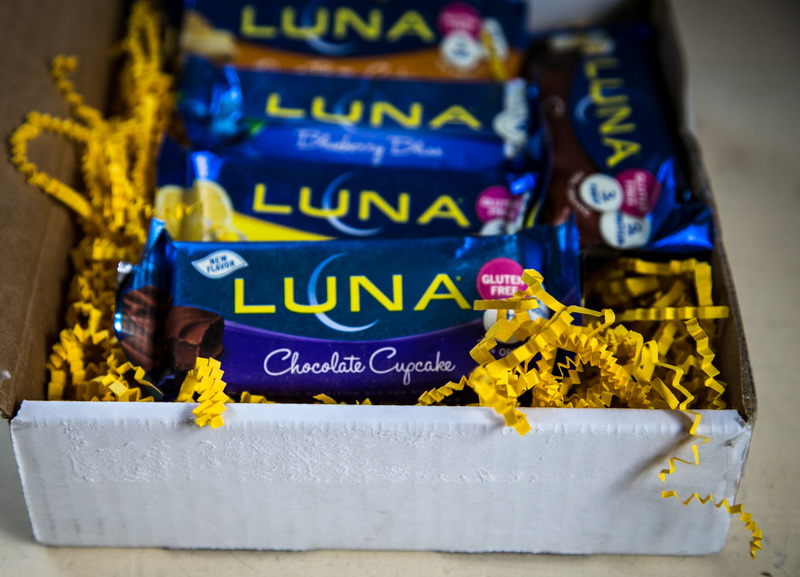 We’re happy to announce Luna Bars as our newest sponsor. We work together with companies whose work and products we truly like, so we can bring them to you. There are a lot of gluten-free foods out there, and we like to point your way toward the good ones. If you’d like to read more about our sponsorship program, click here. Luna Bar would like to give away bars to three readers of this site. Please leave a comment about why you’d like to try the new Luna Bars. Always looking for a quick grab and go. I just tried a GF Luna bar for the first time! It had been so long since I had one – about 5 years since I realized just how sensitive I am to gluten. Thank you, Luna Bar, for taking this step to be more accessible to us GF people. So far I have only found one gluten free bar I like. Hoping maybe these can be added to my list. I wish I could claim to be 6…I have odd food dislikes too. I used to grab one of these running out the door every morning– loved their balance of protein, fiber & carbs. Then I went gluten free… so excited to be able eat these again! So great to see these are now gf – and the flavours sound amazing, would love to try them all! Being super busy with senior year and track season starting up, a good bar is just what I need for the high energy demand!! like wise, they simply don’t exist on any meaningful level if you are a traveller. Airports, yes. Sometimes it’s a gluten free wonderland and other times….a wheat-filled minefield. I’ve learned to carry almonds, dried fruit and protein bars to airports. Some protein bars are so vile, however! I won’t name names but one I once tried had the consistency of that tar they use to fill in potholes. A good gluten free protein bar is a boon to all travelers and oh yes, I have a trip coming up. A Luna bar would fit nicely into my plans. We are fans of KIND bars and Lara Bars over here and would love to try another option. Our main reason for using them is when we’re out and about, in-between meals, and can’t be sure if there will be a gluten-free snack (or non-gluten contaminated snack) available. I’d love to find a delicious gluten free bar that’s tasty and provides energy. Sometimes, I really need it! I used to LOVE Luna Bars and I’m THRILLED they are g-free. My husband has Celiac and is super picky so I know he’ll love one more addition to our snack cabinet. They’re a welcome addition back into our home! For us, bars are the safe food we throw in a bag before flights, dinner parties, etc. when you’re just never sure how good your options will be. Chocolate cake sounds like a winner too. I can’t believe Luna Bars are gluten-free! I’m so happy! I used to live on these when I was running around like crazy between jobs. That was BC – Before Celiac. Ahh! So excited! I travel, rarely get lunch and have struggled to find a good protein bar that was GF and not full of empty calories. This sounds like JUST THE TICKET!! Happy they are certified GF and we can eat without worry. Way to go LUNA! No more gambling when hungry. Much appreciated. I am so thrilled that Luna bars are back in my life! I lived on the s’mores flavor in high school and have loved a few of the new ones I have tried recently. I work 9-5 and then go to grad school in the evenings, so bars like these are a necessity. Would love to give more of them a try! So good to see Luna Bars are now gluten-free! Would love to try the new flavors — glad to hear that Luna has become gluten-free. While backpacking, the more variety of energy bars that my celiac husband can eat, the better! I’m not GF, but Luna bars are my go-to, and I’m happy that my GF friends – and your readers – now have them as an option. Hmm, I’m always up for trying a new bar. My favorite right now are the Kind ones, but I’m open to having my mind changed! I’ve never tried Luna bars, they were introduced several years after I went GF. So excited to see Luna are gluten-free now! I love Kind, Lara and Tanka bars but hearing the flavor “chocolate cupcake” made my mouth water. I live on Kauai and while the island can certainly fall behind when it comes to new snacks on the market, we always keep our eyes open for delicious bars to bring on long hikes and beach adventures. This sounds like a great snack for my 5 year-old son. I’m always on the hunt for healthy snacks for him because he always seems ravenous when he gets home from preschool. I’m so excited about these. My daughter , a college student , is GF and needs every great tasting snack that won’t make her feel ill and get her thru the day! I cook for a living while being gluten free for a year and believe it or not, most times I don’t have time for a GF meal myself so I’d love to keep my energy up with a GF Luna Bar. I had just about given up on protein bars. They just weren’t the right combination for me, including texture! I would absolutely LOVE to try the new Luna bars!! I’ve never tried Luna bars but my blood sugar sometimes goes low on my way to work. Having a bar that is gluten free would be great! Luna Bars used to be my “go to” bar and then after years of searching, found out that gluten was the culprit of the general horribleness I felt all the time…I am beyond thrilled that Luna Bars have decided to offer gluten free. Woooo hooooooooooooo!! My precious niece is a freshman in college far from home. She is gluten free and has a challenging time making sure she eats enough for her crazy busy schedule. I would love to be able to send her a care package of these bars. Thank you!! My precious niece is a freshman at college far from home. She is gluten free and has a challenging time getting enough to eat with her crazy schedule. I would love to be able to send her a care package of these bars. Thank you! Glad that Luna has done this. I always like to keep a protein bar in my pocketbook for emergencies. Sounds like they have some good flavors! What a coincidence! We were grocery shopping the other day, and my husband was looking at protein bars. I usually don’t pay too much attention because most of them aren’t GF, so I don’t bother. The pink circle caught my eye, however, and as I continued to run my eyes over the boxes, I said, “Oh My God, all the Luna Bars are gluten free now! !” I kind of yelled it, actually, and people looked at me weird. I used to love Luna Bars, and now I can have them again. YAY! As a teacher, there are often days when I end up using my lunch break to help students. My students and their needs come first. So on those occasions it would be amazing to be able to quickly pull out a Luna bar and know that what I’m putting into my body will not only give me the energy to make it through a school day but it is safe for me to consume. As a teacher, my days are very busy! I am so happy to hear that Luna bars are GLUTEN FREE and I can eat them again!! It will be great to keep a few at my desk for a quick and healthy snack! My job keeps me on the go! I am a photographer and a photography trainer. I run from location to location sometimes 3-4 per day never mind the travelling out of the country. I have been gluten free for three years and I am always looking for good healthy snacks for being on the go. I will definitely be looking for these to try asap! I’ve never heard of them before. I’ll have to keep an eye out for them. I used to keep Luna bars on hand all the time until I was diagnosed Celiac and had to start being so careful, thank you for bringing me back a favorite!! I would love to try these Luna bars as a snack/small meal before my yoga classes. I don’t want a heavy meal sitting in my stomach as I twist and turn, but a grumbling tummy is so embarrassing . I also travel frequently, and being hungry on an airplane or waiting in the terminal is the pits. These sound like a tasty and healthy solution that will fit in my backpack carry on. A win win solution! as a massage therapist, I frequently get asked about MY diet, and adjunct health issues. As I have been gf about 7 years, snack foods are sometimes a challenge to easily recommend for easy on-the-go action. Very pleased I’ll be able to eat and refer folks to Luna bars! Chocolate Cupcake in a bar? Yum! I’d like to try all those flavors–so much more interesting and healthy than a chocolate bar! So SO happy to find a good gluten free bar option. As a diabetic I don’t have the choice to just skip a meal and I carry gluten free snacks with me everywhere. Which can be very challenging. I’d love to try these and I’ll be keeping my eyes open for them in the stores. I swim early every morning and it would be great to find a tasty quick bar option for after my swim. Always on the lookout for a better alternative than grabbing something junkie and tasteless. Would love to try for celiac family member. I’m traveling to Antarctica in a month to run a marathon and need gluten-free energy. I’m thrilled to learn Luna bars are now gluten free! Love, love, love that Luna bars are gluten free now!! They’ve become my #1 go to bar to take with me to work for a mid-morning snack. Every single flavor I’ve had, I’ve liked! I have always loved loved loved Luna bars, especially as we have transitioned to a wheat-free family. So good, so convenient for our active lot! Lemon Zest is my favorite, but goodness, I sure would love to try the Chocolate Cupcake! Wow, it’s been so long since I’ve had a Luna bar, I don’t remember what they taste like. I’ll have to give them a try. Wow! Who wouldn’t want a GF Cupcake snack! As a teacher, I am always looking for a quick go to snack bar as I am busy during the day teaching, tutoring or running to meetings! I would love to have some new bars for when I am on the go!!! I am so tired of the same old ones I have been eating and would live to try these. Thanks! I’m constantly running around with two toddlers (all of us are celiacs.) between preschool pick-ups, library time, and a myriad of other errands I am always looking for a nutritional snack to keep in the car for emergencies. These would be great! I’d love to try these bars! Thanks for the chance to win. I am really excited to hear this news! I have never had a Luna bar but I Always eyed them at the grocery store and worked with a man who had them on hand as his snack food. The reason I have never had them is because they were not gluten free and I have been gluten free 3+ years. Made me sad because they looked so nutritious! I am thankful to hear they are now going to be gluten free! I look forward to adding them to my diet in the future. Thank you for thinking of people with gluten allergies and Celiacs disease it’s over looked by SO many companies. Look forward to being a happy customer of your products!! I am a full time garden creator and maintainer. I burn significant calories all day long and l’m thrilled to hear I can now replace that loss with my old friend LUNA! Welcome back into my diet! Are all Luna Bars now Gluten free or just the ones marked with the pink circle? I’d like to try the new Luna Bars because the flavors sound delicious, I’m always in need of a convenient on-the-go snack, and the nutrition sounds awesome. I already like Luna Bars. I haven’t tried Chocolate Cupcake or Blueberry Bliss or gluten free varieites and am interested to try them! Blueberry Bliss is perfect for the gourmet backpacker with a cup of campfire coffee in the cold early daylight. Its like a yummy blueberry muffin–but squishable in that little tiny nook you have left in your backpack after the essentials are stuffed in. My daughter is away at college and is gluten free.I am always looking for something to send her in a care package that can help to keep her going all day long. Would love for her to try these. With my due date in only a few weeks, I am going to need good calories for my night nursing sessions! I have long been a Luna Bar fan and am THRILLED to hear that they are making them gluten free! I am SO grateful for the Luna Protein bars. I love the Chocolate Mint, as it reminds me of Thin mints, which I can no longer eat due to my celiac disease. I actually had the Lemon Vanilla bar today that came in my Send Me Gluten Free box. Filling and reminiscent of a lemon bar. Full of protein yet indulgent as well. Still intolerant to gluten free oats, so I will still need to read labels even though they all say gluten free now. I was unaware they were gluten free. I’m always looking for snacks on the go that have some nutritional value. I love Luna Bars! Chocolate peppermint stick and white chocolate macadamia nut go back and forth as my favorite. I love keeping them in my desk drawer at work because I never remember to bring snacks/food to work and never seem to get away to get lunch. They call the vending machine at work the wheel of death for a reason. i used to eat many more bars before going gluten free… It would be great to have these back in my arsenal for in-between-classes snacks! These look yummy! I would love to have something like this to keep in my bag for when I have no other options. Thanks! I would love to try a Luna bar! Thanks for the terrific give-away 🙂 The lemon and blueberry bars sound interesting- I am always looking for an alternative to chocolate. I’m always looking for tasty gluten free options while biking and hiking. This will be perfect! I used to eat Luna bars before I had to go GF and I really liked them. For the exact reasons you described, I liked to have them on hand (in my purse, emergency energy fulfillment in my desk, or while traveling) and I’ve missed them. I have trouble finding bars that are full of healthy ingredients but not too much sugar or fat, and a decent amount of protein. I would love to try their new GF bars to have that option back in my life! What does it mean that they’re “designed for women”? Thanks! I have recently decided to go gluten free in hopes of curing a stomach problem. It’s a little daunting and I am learning so much. I thrilled to know there is a tasty bar I can have around for snacks and emergencies. I just went gluten free and I am SO happy to have found you. I live in Rome, Italy and snack choices are very difficult to find especially in the land of bread…panini, pane e pizza! I just got back from the grocery store and I found some naturally dried fruit but would LOVE some Luna bars here in Italy. I use to eat them all the time when I lived in Boulder, Colorado. If I am chosen you could send the bars to my parent’s house in MN. Ha! If you’re ever in Rome let me know and I will take you for a spin on my Vespa…vrooom! My hubby with celiac needs quick food options for days when he forgets to make lunch or has to run errands during his meal break. He’d love to have more options & a Luna Bar trial pack would be a great way to do that. Thanks for sponsoring the giveaway! Yum, chocolate cupcake…. Need I say more?? So far I have only tried Kind bars, but would love to have more variety!! I would love to try the new Luna Bars because every flavor I’ve ever tried has been delicious and I love yummy, healthy snacks! I love that they are gluten free and packed with vitamins.